Construction fencing has gone up around the old Salvation Army thrift store. 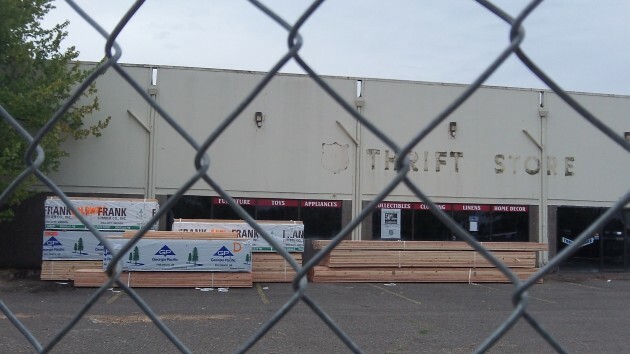 Albany’s downtown neighborhood where Main Street and Santiam Road meet is about to get another big upgrade with the remodeling of the long-vacant former Salvation Army thrift store. Baldwin General Contracting Inc. has bought the building and, after months of working through zoning and other issues, this week took out a permit to rebuild the structure as its offices. The building had become an eyesore since the thrift store closed several years ago. Last February, the city council turned down a change in zoning code language that would have allowed a bottle redemption cooperative to remodel it as a redemption center. 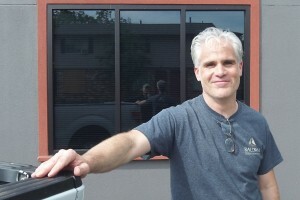 Yohn Baldwin outside the company office on Cleveland Street. Yohn Baldwin, owner of the contracting company that bears his name, has been working on acquiring the building since March and also faced a zoning issue. A construction yard would not be allowed in the Main Street Zoning District, but Baldwin says he was able to demonstrate to the city that it would be an office building instead, and that is allowed. “This is a challenged project in several ways,” Baldwin says in an email. Besides the zoning, there was all that “deferred maintenance.” Also, the building sat on four parcels with two separate owners, requiring a lot line adjustment. Cleaning up a homeless camp in back yielded enough trash to fill eight Dumpsters. Then he found an old Oregon Electric rail spur buried behind the building and a sewer lateral that had collapsed. This is close to a million-dollar project. Baldwin says the price to buy the property was $350,000, and he estimates the renovation to cost another $610,000. Now based at 422 Cleveland Street S.E., the company currently employs 23 in the office and 53 hourly craft workers. The offices will move around the corner to the new building at 1224 Santiam Road. Among the Baldwin company’s other notable construction projects in the mid-valley are the main fire station in Scio, Willamette Community Bank in Albany, and seismic upgrades of Central Elementary school and Albany Fire Station 12 on 34th Avenue. Kudos to Mr. Baldwin, and what a novel concept – no mention of approaching CARA for money!!!!! He probably wouldn’t get money since it’s NOT downtown. If it actually ends up looking like the picture, I’d say kudos too! I’m sure it’ll look MUCH better than a recycling center the merchants are trying to foist on us. The Oregon Beverage Commission is simply a group funded by the grocers in order to shirk their responsibility. It is NOT a “state commission”. It may be within the “reach” of CARA, but how often have they funded projects that weren’t downtown.